Purr-fect for your Batman collection! This tiger has changed its stripes! Like many of Batman's memorable foes in the 1960s TV series, Catwoman underwent several metamorphoses over the run of the show, and in Season 3 she was played by sultry singer Eartha Kitt. 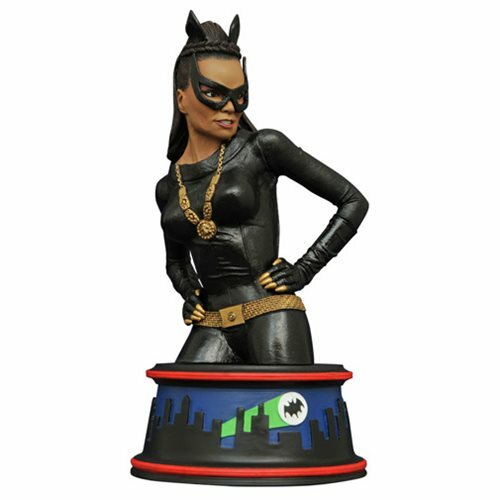 Designed by Barry Bradfield and sculpted by Jean St. Jean, this 6-inch tall resin Batman 1966 TV Series Catwoman Mini-Bust depicts Kitt as Catwoman, perched atop a colorful base inspired by the show's animated opening credits. It's the purr-fect addition to your Batman classic TV series bust collection! Packaged in a full-color box with a certificate of 3000 pieces authenticity.